Baby-Benz 190 E 2.5-16 - The "Ockhuisen" Mercedes-Benz Collection. The “Baby-Benz” as a super sports car. The 190 E 2.5-16 Evolution II was an early highlight in the success story of exclusive sports saloons from Mercedes-Benz’s compact class. 28 years ago, this apogee of the W 201 model series thrilled professionals and the general public alike when it was unveiled at the Geneva International Motor Show. The touring car developed for Group A racing on the basis of this sports saloon went on to acquire legendary status. Mercedes-Benz took the first three places in the DTM championship in the 1992 season with this vehicle, which was referred to succinctly as the “Evo II”. Today, the Evo II presents a fascinating spectacle as a works racing car from Mercedes-Benz Classic competing in historic motor sport events. Mercedes-Benz 190 E 2.5-16 Evolution II (1990). 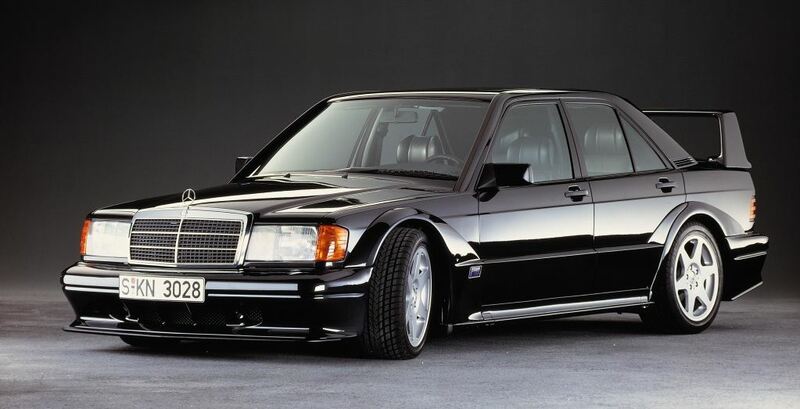 Compact, powerful and muscular: the Mercedes-Benz 190 E 2.5-16 Evolution II exuded self-assured sporting prowess at its premiere at the Geneva International Motor Show in March 1990 – and not without reason: the sports saloon provided the basis for the new Group A racing tourer with which Mercedes-Benz competed in the German Touring Car Masters. At the same time, the Evo II was also a particularly powerful protagonist in the strategic product initiative which the Stuttgart-based brand was rolling out at the time. 25 years ago, the sports saloon laid the foundations for the special tradition of high-performance vehicles such as are offered by Mercedes-AMG today – culminating in the C-Class in the current C 63 S of model series 205 rated at 375 kW(510 hp). The Evo II did justice to its appearance by virtue of a further development of the 2.5-litre oversquare engine adopted from the 190 E 2.5-16 Evolution, which had demonstrated excellent stability irrespective of rpm variations ever since its introduction in 1989. The engine’s output had been raised once again in comparison to the first Evolution model from the previous year, the Evo II now generating 173 kW (235 hp) of power as opposed to the previous 143 kW (195 hp). The top speed was 250 km/h, and the Evo II accelerated from a standing start to 100 km/h in 7.1 seconds. The body had also undergone further refinement on an aesthetic and technical level. The Evo II chassis, which had been modified for racing use, was fitted with 17-inch wheels (as opposed to 16-inch), for example. The vehicle’s aerodynamics were improved by new front and rear bumpers with integrated spoilers, wheel arch flaring integrated into the line of the body and the highly pronounced rear aerofoil. In all, 502 units of the Evo II were produced – available exclusively in blue black metallic. At the time of its original presentation the Evo II was priced at DM 115,259.70, or DM 119,717.10 with air conditioning. Mercedes-Benz presented the compact class W 201 in 1982 as a completely new, third main line in its passenger car range. The model series set new standards in efficiency, handling, safety, and design, while also lending the Stuttgart-based brand a younger and fresher image. The general public came to refer to the W 201 as the “190” or the “Baby-Benz”. Racing successes were to add magnificent sporty dynamism to the vehicle’s merits, although initially the Evo II was not associated with sporting prowess: the first entry-level models generated an output of 66 kW (90 hp, 190 model) and 90 kW (122 hp, 190 E model), while the 190 D diesel model launched in 1983 managed 53 kW (72 hp). 1984 saw the launch of the lively six-cylinder 190 E 2.3-16 (136 kW/185 hp), however. This vehicle marked a departure from the doctrine of moderation and restraint for the compact saloon. Airfield race Wunstorf, 9 June 1991. 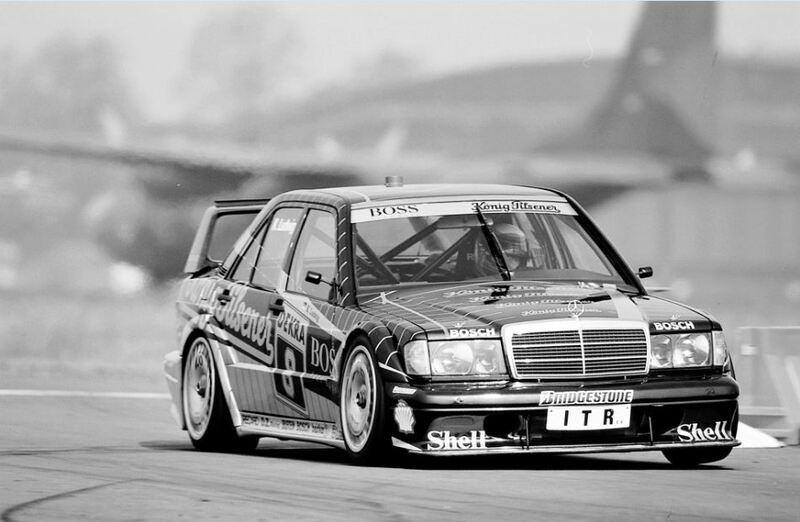 Klaus Ludwig (number 8) on AMG Mercedes-Benz racing touring car 190 E 2.5-16 Evolution II (W 201) comes on third place in the overall results. The 190 E 2.3-16 put in a brilliant performance in the opening race of the new Nürburgring in 1984, which was won by the then largely unknown Brazilian Ayrton Senna. In 1988 Mercedes-Benz entered the German Touring Car Masters (DTM) with the racing tourer developed from the series production version, and Roland Asch finished the season as Vice-Champion. Meanwhile, the motor sport specialists in Stuttgart were already working on their next coup, developing the 190 E 2.5-16 Evolution (1989) and 190 E 2.5-16 Evolution II (1990) models on the basis of the road-going version of the sixteen-valve model. 502 of each model were built, in compliance with the requirements stipulated by the FIA (Fédération Internationale de l’Automobile) regarding the homologation of Group A vehicles for the DTM. Racing use and innovation go hand in hand. While the 245 kW (333 hp) 190 E 2.5-16 Evolution racing tourer was enjoying its initial success, work on the second development stage got underway in earnest in August 1989. The last of 502 Evo IIs was built in Bremen in May 1990. AMG then assumed responsibility for converting the vehicles destined for racing use. The 274 kW (373 hp) racing tourers now went into production with body components such as bonnet, boot lid and spoiler in extremely lightweight and robust plastic. 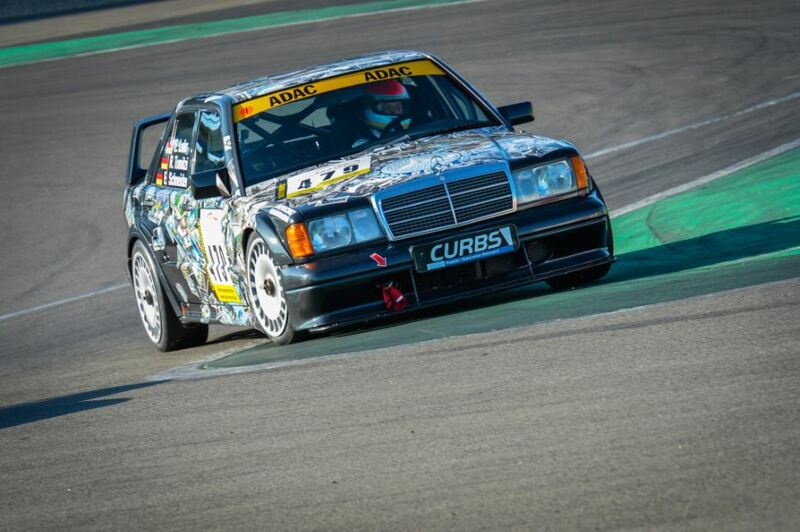 Mercedes-Benz Classic racing car Mercedes-Benz 190 E 2.5-16 Evolution II (W 201) on its way to the Youngtimer Trophy during the Historic Trophy 2014 at the Nürburgring in June 2014. The Evo II had its racing debut on the North Loop of the Nürburgring in the DTM on 16 June 1990. In the final race of the series at the Hockenheimring on 15 October 1990, all the works-supported teams were provided with the new vehicle. In 1990 Kurt Thiim took 3rd place in the DTM, and in 1991 Klaus Ludwig was runner-up. In 1992 Ludwig won the DTM Championship ahead of Kurt Thiim and Bernd Schneider – all three driving a 190 E 2.5-16 Evolution II. In the 1993 season, Roland Asch finished as runner-up in the successor to the Evo II, ahead of his team colleague Schneider. In March 2015, the Mercedes-Benz 190 E 2.5-16 Evolution II has celebrated its 25th birthday. To this day the young classic retains the fascinating allure that it first revealed when it was unveiled as a new compact sports saloon at the Geneva International Motor Show in 1990. This enduring appeal is particularly true of the 190 E 2.5-16 Evolution II configured by Mercedes-Benz Classic as a works racing car, which adds a special shine to historic motorsport in its appearances at Youngtimer Trophy meetings. The Ockhuisen W201 190 collection is complete!